Interview: Adam McKay And Michael Lewis On 'The Big Short' How do you make a subject as dense as the subprime mortgage crisis into a compelling movie? That's the challenge Adam McKay took on when he decided to turn Michael Lewis' book into a film. 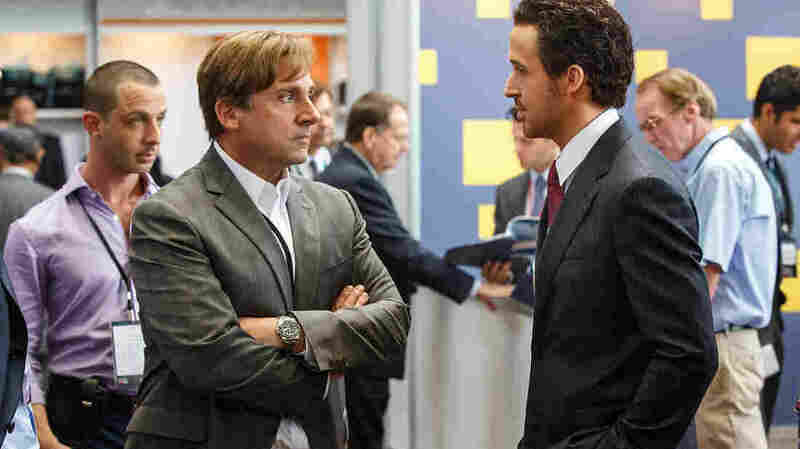 Steve Carell plays Mark Baum and Ryan Gosling plays Jared Vennett in The Big Short. Director Adam McKay says, "One of my favorite moments in the movie is where you see ... Mark Baum make a large chunk of money and feel absolutely disgusted by it." How do you make a subject as complicated as the subprime mortgage crisis into a really good movie? That's the challenge director Adam McKay took on when decided to turn The Big Short, Michael Lewis' best-selling book about the people who profited from the crisis, into a film. The result (also called The Big Short) has bad guys and heroes — but even the heroes are kind of jerks. Kelly McEvers: The way the housing market imploded is obviously not an easy thing to explain. It's a little bit easier in a book — people can take their time, you can sort of go back and reread — but in a movie you've got two hours to not only explain things like collateralized debt obligations, but you also have to make it entertaining. Adam, were you intimidated by that? Adam McKay: You know, I'm going to do something I don't like to do which is I'm going to give Michael Lewis a lot of credit. He wrote a book that was kind of amazing in the sense that it fused these incredible characters with a lot of dense information. And because he was able to tie that information to their stories, I was able to digest it. Michael Lewis: So, can I interrupt? So I think the big thing that I think he does in the movie that's so important is he doesn't condescend to the audience. He treats his audience as if they can understand it and makes them feel as if it's OK if you don't get quite all of it, because the gist of it is all you need. McKay: You know, when I read the book there was a section Michael had where in a footnote he actually told me as the reader: If I was following what he was saying to this point, I deserve a gold star. And I remember thinking, "Wait a minute, did he just talk to me?" And that sort of inspired this idea that this movie can break the fourth wall. You don't want to do it too much, but there can be a little bit of a conversation with the audience. McEvers: At one point there's a naked lady in a bathtub explaining one of these things. .. I just have to ask, did you ever think you were pandering just a little too much to the audience? Lewis: Or how to defeat ISIS. McKay: She probably could to that. So, you know, is it pandering? You know, in a massive, massive way that hopefully is more satirical than sincerely pandering. McEvers: Let's talk about the main characters in The Big Short, the group of people who, a long time before it happened, figured out that we were heading off of a financial cliff and then basically made this huge financial bet that it was going to happen, thus "the big short." In the film, you describe them as "outsiders" and "weirdoes". Possibly the weirdest is this doctor, Dr. Michael Burry [played by Christian Bale]. Michael Lewis, you met this person. Can you tell us about him? Lewis: Sure. In many ways he's who makes the book possible because — Christian Bale gets this across but it's never said in the movie — he has Asperger's syndrome. He's in San Jose, Calif., basically not seeing anybody face-to-face. So he lives his whole life by email and one of the first things he did after I met him was dump all of his emails going back to the beginning of the crisis on me, and I could reconstruct it through this man. So the idea of the book and movie is that it's not an accident that these people are the ones who saw what the system failed to see and was blind to. They had qualities in them that enabled them to see. And in his case, it was a total resistance to the propaganda coming out of Wall Street coupled with an insistence on seeing what the numbers were. And so he pieced together the crime as it was being committed. McEvers: You know, in order to tell this really compelling story on the screen, you had to do it through the eyes of these guys who bet against the housing market, who did see this coming but then got really rich off the fact that they saw it coming. I mean these are not ultimately good guys in a traditional sense, right? McEvers: Some money? A lot of money. Lewis: Yes, they walk away with a lot of money. McEvers: I mean, at one point, Christian Bale's character is writing to one of his clients saying, "We're depositing $400 and some million into your account. You're welcome." McKay: And they hate him. Lewis: And they hate him. McEvers: OK so they hate him, but that guy who hates him is really rich now. McKay: I also think ... the point of the movie is too that, yes, these guys made money, but it's also asking the question of like: Alright, yes, they made money but is this really what it's about? I mean, is it OK to make loads of money in a corrupt system that, as Michael said, is incentivized to create bad products that cost people their homes? And one of my favorite moments in the movie is where you see Steve Carell as Mark Baum make a large chunk of money and feel absolutely disgusted by it. McEvers: I mean, I wanted to ask you so much about that moment because here I'm sitting there, I'm crying for Steve Carell and then I realize that he makes $200 million and I kick my chair, you know. McEvers: Oh that's what you want? McKay: That makes me very, very happy, yes yes. McEvers: It makes me mad. Lewis: It's better than feeling nothing.